The biopic of Edward D Wood Jr, the legendary ‘Worst Movie Director of All Time’ is arguably Tim Burton's best film. What could have been little more than a smug exercise in sneering turns out to be a surprisingly moving celebration: the triumph of unstoppable enthusiasm over the lack of any conventional talent. 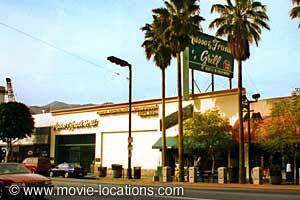 Burton managed to find plenty of period locations (supposedly 68 of them) around Los Angeles, including the suburbs of Torrance; Sierra Madre; Long Beach; Norwalk; Gardena and Eagle Rock, and even discovered unchanged corners among the tacky, redeveloped streets of Hollywood itself. 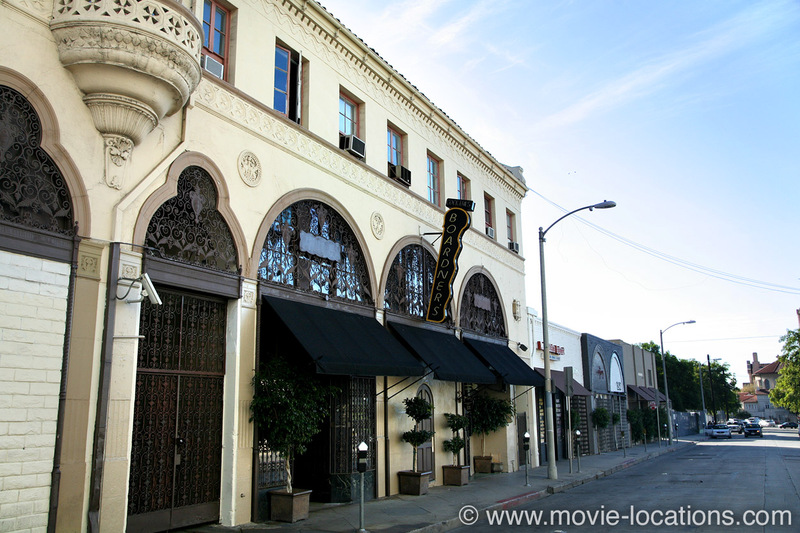 Clunky war drama The Casual Company, written and directed by Ed Wood (Johnny Depp), was filmed at Theatre/Theater, 1713 Cahuenga Boulevard at Hollywood Boulevard. The theatre – which really was the home to the stage production in the 40s – was demolished in 1998 to make way for the Greyhound bus station. The fledgling director finds encouragement reading the reviews (“‘The soldiers’ costumes are very realistic.’ – that's positive!”) with the rest of his cast at Boardner’s, 1652 North Cherokee Avenue, a traditional old Hollywood hangout since the 1940s, just south of Hollywood Boulevard, seen also in LA Confidential and as the after-work hangout of Harrison Ford and Josh Hartnett in Hollywood Homicide. To the left of Boardner’s you can see the vacant shop premises dressed as the Hollywood Funeral Home, where Wood first sees Bela Lugosi (Martin Landau) testing coffins. 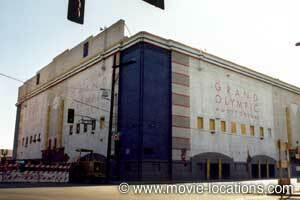 Wood begins to assemble his extended family of oddballs when he encounters wrestler Tor Johnson at the Olympic Auditorium, 1801 South Grand Avenue at Olympic Boulevard, downtown Los Angeles – it's the venue where the boxing scenes from the Rocky movies and Raging Bull were filmed. The famous hat-shaped Brown Derby restaurant, where Wood hosts a fundraiser, is long gone. Opened in 1926, it was the first of a chain of movieland hangouts (and the only one actually built in the shape of a hat) of which only one, in Los Feliz, remains. For the film, the Derby was recreated in the grounds of the Ambassador Hotel on Wilshire Boulevard. Now even the Ambassador itself has gone. Opposite the site of the old hotel, if you look north along Alexandria Avenue, you can see a strange dome atop the Brown Derby Mall on your right. This is what remains of the original Brown Derby. 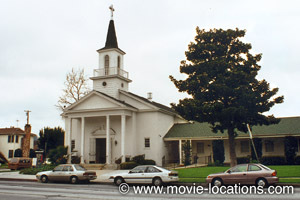 Up in the San Fernando Valley, you can see the church attended by the cast of Wood’s undoubted masterpiece, Plan 9 From Outer Space, as the director seeks funding from unorthodox sources. It's the Toluca Lake First United Methodist Church, 4301 Cahuenga Boulevard in Burbank. There were a couple of authentic locations: The Bride of the Monster sequence, with Lugosi battling a rubber octopus, was filmed where the real Ed Wood actually shot his classic in Griffith Park, and Wood's home in the movie is the director's last apartment in Hollywood. 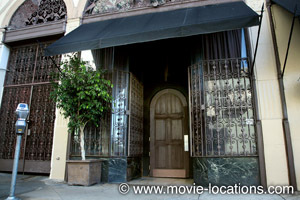 His inspirational meeting with idol Orson Welles was shot in another classic Hollywood landmark, the oldest restaurant in the city, Musso and Frank's Grill, 6667 Hollywood Boulevard (across Hollywood Boulevard from Boardner’s and the funeral home, and recently seen in Steven Soderbergh's Ocean's Eleven and in Charlie's Angel's: Full Throttle. After Wood's timeless classic is completed, the director and his cast turn up for its premiere at the wonderful Pantages Theatre, 6233 Hollywood Boulevard at El Centro in Hollywood. 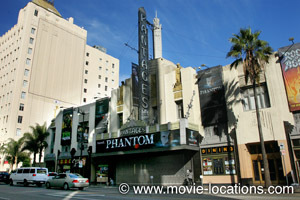 That's not the interior of the Pantages' though. If you want to peek inside Pantages, see Batman Forever (where it appears as a casino), Species (as a nightclub) or The Bodyguard (as the Oscar venue). The cinema auditorium with the rowdy crowd is actually that of the slightly less grandiose Orpheum Theatre, 842 South Broadway, downtown Los Angeles, seen in Kenneth Branagh's Dead Again, Oliver Stone's The Doors, Arnold Schwarzenegger oddity Last Action Hero and used for the movie premiere upstaged by Jack the terrier in Michael Hazanavicius' Oscar-winning The Artist.